Have you ever wondered what it's like for kids who grow up inside of a traumatic life? Or were you one of those kids and had no words to describe the indescribable? 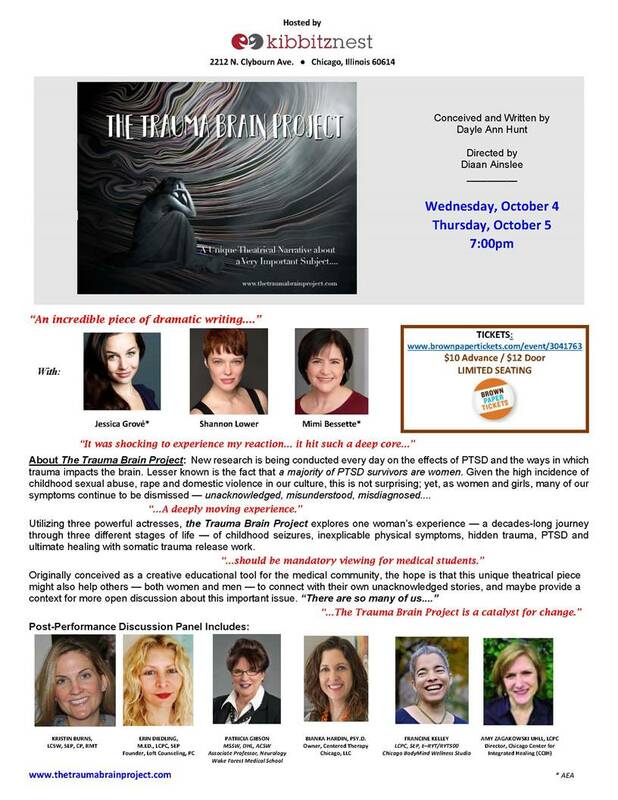 Playwright Dayle Ann Hunt has illustrated the impact of trauma on the life of a child, then adolecent, then adult through her dramatic narrative The Trauma Brain Project. She has teamed up with Broadway actresses to share this with New York and Chicago audiences. Originally her play was created for medical students to understand the impact of trauma on their patients' every day lives. And then her play grew to new audiences. Ms. Hunt's work is powerful and necessary. It helps the audience understand what it is to get inside the head of someone with PTSD. Truama crosses racial, economic, social, political and geographical lines. This play is educational, enlightening and moving. and because of the nature of the material and the questions it engenders, Dayle Ann has asked a panel of physicians, therapists and bodyworkers to be on a post-play discussion panel. We hope you'll join us next week in Chicago Wednesday or Thursday October 4th or 5th at 7pm. at Kibbitznest on Clybourn Ave. The flier and ticket iniformation is attached below.